The Ashford to Folkestone section of the SER’s Dover trunk line came into use on 28th June 1843, Westenhanger existing as the sole intermediate station between the two towns. Over two decades later, in 1864, the SER received Royal Assent for the construction of a double-track branch line, 3½-miles in length, to Hythe and Sandgate, which left the Kent Coast main line at Sandling. The ultimate goal was to extend the branch line to Folkestone Harbour, to allow direct access to the Harbour station, avoiding the steep incline to Folkestone Junction, and bypassing the need for a reversal manoeuvre at the latter. A protracted planning and construction programme ensued, funding for the scheme decidedly lacking, but the branch eventually opened through to Sandgate on 9th October 1874. Two years later, Parliament formally approved the extension of the line to Folkestone Harbour, which was three miles to the east. The SER planned for the line to run parallel with the coastline, at the back of Sandgate beach, but trouble was afoot. With aesthetics in mind, the residents of Folkestone, and the prominent Lord Radnor, opposed the route: should the eastward extension of the branch go ahead, the rails must pass under Folkestone by means of a tunnel. Unfortunately for the SER, boring a tunnel would multiply the cost of the extension by several times, and as it later transpired, the company took the branch no further than Sandgate, leaving the 1 in 30 descent from Folkestone Junction as the only means of access to the Harbour station. 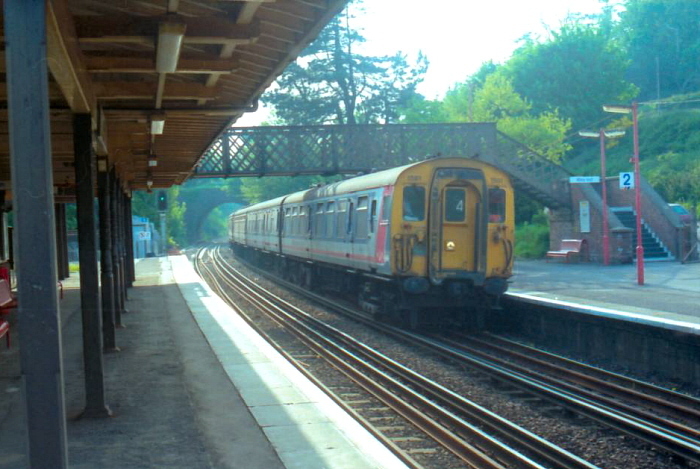 From the outset, passengers made their connections between the main line and the Sandgate branch at Westenhanger. This situation was markedly improved upon by the opening of a new station layout at the point of divergence, on 1st January 1888; the station was known as ‘’Sandling Junction’’ from the outset. This was a spacious arrangement, comprising no less than four platform faces – two for the main line, and a pair of tightly curving faces for the departing branch line. 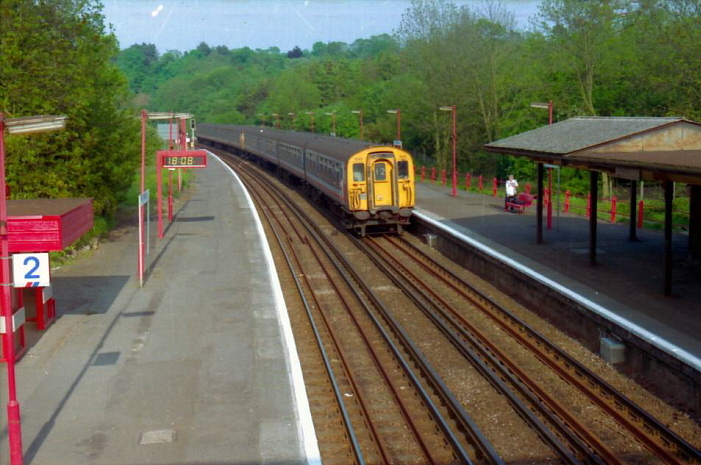 The station had, in effect, two main buildings: one upon the ‘’up’’ branch line platform, and a second alongside the ‘’up’’ main line platform. The architecture here was untypical of the SER: both structures were single-storey in height, and were built to a Mock Tudor style. Only the 1883-opened Nutfield station, on the Redhill to Tonbridge section of the SER’s original main line route, was completed in this manner. The ‘’up’’ branch platform was without protection from the elements, but the ‘’down’’ side and both main line surfaces were equipped with pitched roof canopies. These were simple affairs, featuring a triangular cross-section and lacking any form of valance. The ‘’up’’ main line platform and the ‘’down’’ branch platform combined to create a large single triangular surface, of which can later be appreciated within the accompanying images. The main line platforms were linked by an 80-foot-long lattice footbridge (of which acquired a roof three years after opening), whilst the branch surfaces were instead connected by means of track foot crossings, located at both ends of the platforms. Mention should also be made of the Station Master’s House: this was a substantial two-storey affair, complete with a large garden, and resided just to the west of the ‘’up’’ branch platform. Since the station’s raison d'être was solely to provide an interchange between the main line and the Sandgate branch, no dedicated goods yard existed at the layout. Nevertheless, two refuge sidings were still in evidence, these flanking either side of the branch line platforms. The site was controlled by two SER-designed timber signal boxes: the first controlled the junction with the main line, and was positioned on the ‘’up’’ side, to the west of the station; the second cabin was erected at the southern extremity of the ‘’up’’ branch platform, and controlled access to the refuge sidings and the platform lines from the Hythe direction. The tight curvature of the branch line tracks within the station required the installation of guide rails. As mentioned earlier, the SER was thwarted in its ambitions to reach Folkestone Harbour from the main line at Sandling. As a result of the line terminating at Sandgate, traffic along the branch was consistently light. It was left to the Southern Railway to implement the first wave of cutbacks: on 1st April 1931, the Hythe to Sandgate section of the branch line was closed completely, and the remaining stretch between the former and Sandling Junction was singled. At the Junction station, the ‘’up’’ branch line platform was taken out of use, its track lifted, and the signal box on this surface decommissioned. The station building upon this platform, however, remained in use as a ticket office. The Hythe branch had only a brief British Railways existence: on 3rd December 1951, the line was closed to traffic completely. The ‘’Junction’’ suffix was dropped from the main line station’s name boards, and thereafter, these read ‘’Sandling for Hythe’’. 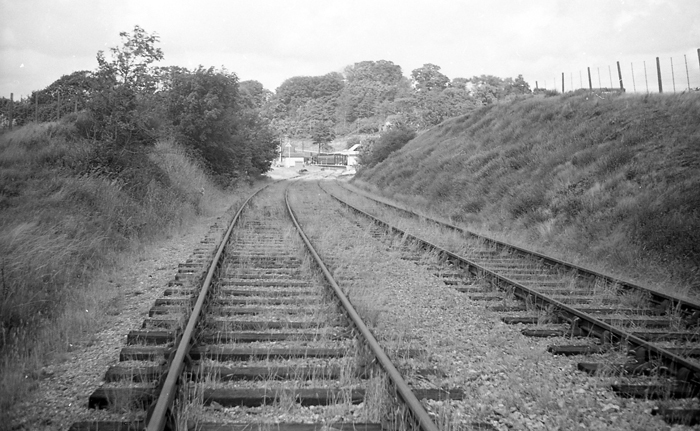 The remaining single-track which ran alongside the ‘’down’’ branch platform was, however, retained as a siding, and it also served as an elongated head shunt for the earlier mentioned refuge sidings. Previously, in 1949, the Southern Region proposed renaming the station ‘’Hythe Junction’’, but this was soon rejected in favour of keeping the existing title.